The Nichiren Shoshu Administrative Office submits a letter of inquiry to the Gakkai regarding Fukushima’s comments. On behalf of Nittatsu,Taiseki-ji’s Internal Affairs Department submits a letter of inquiry to the Gakkai regarding Fukushima’s comments. The Hokkeko Federation (an association of temple parishioners) holds an emergency board of directors meeting and passes a resolution requesting Mr. Ikeda’s resignation from the position of chief lay representative. Taiseki-ji’s Internal Affairs Department, dissatisfied with the Gakkai’s response to its initial inquiry, sends another letter of inquiry regarding Fukushima’s statements and other matters. 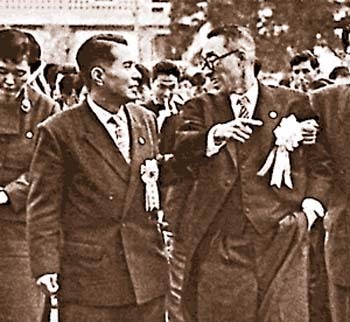 Mr. Ikeda meets with Nittatsu in hope of restoring harmony. At the meeting, Mr. Ikeda communicates his decision to resign from the position of chief lay representative. The Soka Gakkai publishes an apology in the Seikyo Shimbun for Fukushima’s statements under the name of Hiroshi Hojo, then the general director. To resolve the conflict and prevent Gakkai members from being subjected to further abuse from the priesthood, Mr. Ikeda announces his resignation from the position of Soka Gakkai president at a prefecture leaders meeting. He becomes honorary Soka Gakkai president, and Hiroshi Hojo becomes the fourth Soka Gakkai president. The priesthood asks the Gakkai to no longer allow Mr. Ikeda to attend meetings and to refrain from covering his activities in its daily newspaper, the Seikyo Shimbun.